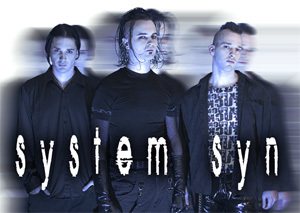 Clint from System Syn was with us on air Saturday afternoon for our podcast interview series on Second Shifters ( http://www.secondshifters.com ), and he shared with us a bit about himself and the band he worked so hard to form. He picked up his first guitar when he was 15 years old at a garage sale and he’s been playing ever since. It’s quite amazing to see just how far he’s come with it, and we’re sure that you’ll agree when you hear the music mixed into the interview. As a musician proud to be under an independent label, Clint’s views and music are well worth listening to, and we’re sure you’ll be glad you gave them a listen. Sanctuary and I both had a great time bringing the band to you and with our chat celebration to go along with the debut of their work. We hope that if you like what you heard that you’ll consider picking up their latest CD ‘End’, which just went on sale last month.